Technically, I was supposed to organize a Cocktail and Conversation post for today, but those posts always sneak up on me, so it didn't get done. I also didn't get my post written for last week because, among other things, I spent over two hours on the phone dealing with insurance, then got called into work on my day off. So I decided to go ahead and do my post today because I really liked my post that I was mentally composing whilst on the phone (because who really wants to pay attention while they are dealing with insurance stuff?). With the end of the year looming before us, I've begun thinking about what I've read this year and what I really liked. I didn't read a ton this year, I never do. But I feel like I read a pretty good variety for me. As a result, I am kind of surprised by the books that are quickly becoming solidified as my favorites for this year. I usually read mostly fiction. I'll usually read a couple of non-fiction books for fun, which I enjoy, but don't usually totally knock my socks off. So, imagine my surprise when--as I am reflecting on my favorite books of the year--I realize that my favorite reads this year are non-fiction. Naturally, I am not stopping reading for the remainder of the year, but I feel pretty comfortable in naming these as my favorite reads of the year. 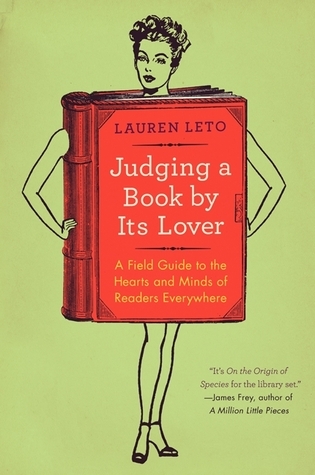 Judging a Book by Its Lover by Lauren Leto This one came in a BookRiot Quarterly box earlier this year. When I first read the description on the back, it didn't really sound like me, so it kind of hung out on my bookshelves for a while. One afternoon or evening I wound up grabbing it and flipping it open. I finished the next day. Leto's book is full of a lot of really interesting and short essays or pieces about reading and not taking reading too seriously. It has a very long list of what your favorite author says about you. It has a long chapter on how to fake reading certain authors, which really turns out to be a great reading pathway if you choose to actually read some of Dostoevsky's works (to name one author). I had a lot of fun reading this book. It really helped me chill out and decide to not pressure myself so, so much with my reading. I read for fun. So isn't stressing out over what I'm reading totally defeating the point? It is, it is. Thus ends the books I've actually finished. The remaining ones on my list are all in progress. I think I'll finish two of them by the end of the year. One, however, is perfect for stringing out for a while. 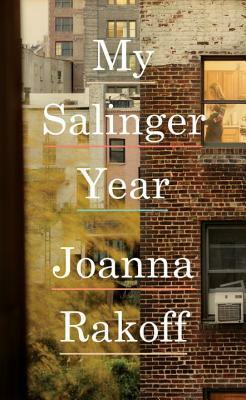 My Salinger Year by Joanna Rakoff I'm at the halfway point with this one. It was a quick read for me up to that point. I would have made more progress, actually, if I hadn't stopped for watch an episode of NCIS with my parents (it's our family time). I am loving reading about the publishing industry during the late 1990s. Rakoff is extremely relatable to me. She faces a lot of issues that I faced and still face today, like the part when she realized that her friend who had always written poetry had let that dream die and how that affected their friendship dynamic (basically--people change). I can't wait to see what happens next. It's an unputdownable memoir. Love it! 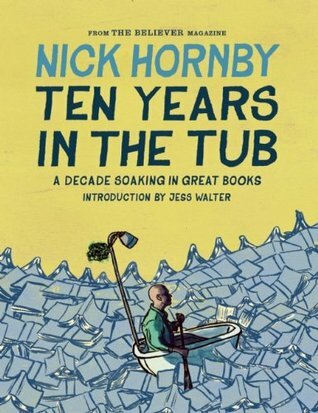 Ten Years in the Tub by Nick Hornby Beginning in the early 2000s, Hornby (author of High Fidelity and About a Boy) began writing a monthly column for Believer magazine. He continued writing this column for ten years. This volume collects all of his articles. Each month begins with Books Bought and Books Read, then he discusses what happened and offers up impressions of his reading. He also offers up a lot of wisdom about his reading life in the process. For instance, he muses that the books we buy probably say more about us than the books we actually read because the books we buy illuminate who/what we aspire to be, whereas we read books for a variety of reasons that are sometimes have less to do with us than outside forces. He also shows that you can do a whole lot of reading while still having outside interests (for him it's soccer and music) and that it's OK if sometimes those outside interests overshadow our reading for a while. This was another that made me realize that reading doesn't have to be a super serious venture. The Year of Reading Dangerously by Andy Miller I impulse bought this one a couple of days ago, when it was released. Except I had to buy an e copy because none of the stores near me had any physical copies in stock. It's fine, but I would have preferred the ability to underline and mark pages for future use. Anyway, Miller decides that he's dissatisfied with his reading life, so he decides to organize it a bit more. He starts with a list of ten classics that he's really kind of ashamed that he hasn't read yet and vows to start reading them. The list ultimately grows to fifty books. He works his way through each novel. The book he writes details his journey through the list, what happens to him along the way, how the novels make him feel and how they impact his life, etc. It's not a ton of literary criticism or a book review of each novel, which I really like. Though, reader beware, there are spoilers to the plots of these books. So far for me this hasn't been too big of a problem, but once he gets to reading novels I really want to read but haven't yet read, I'll probably wind up skipping those bits. This one is a bit more serious because it explores the importance of literature and reading, but I think it's ultimately about pleasure and one man's way of making his reading journey pleasurable to him. I'm still really excited about all of the reading I have left for the year. In addition to finishing the Rakoff and Miller and making more progress on the Hornby, I am working on I Am Charlotte Simmons by Tom Wolfe, tentatively starting Wuthering Heights by Emily Bronte, and making some plans for my upcoming reading goals and ventures. Plus, there absolutely must be a reread of David Sedaris's Holidays on Ice. It's a must for this time of year. What have been your surprise favorites of the year? I've been seeing My Salinger year a lot and the others look amazing as well! I like the idea of reading about reading, I don't think I've ever done that before... (: Thanks for sharing! I love this! I've added Judging a Book By Its Lover to my list ... it looks great! 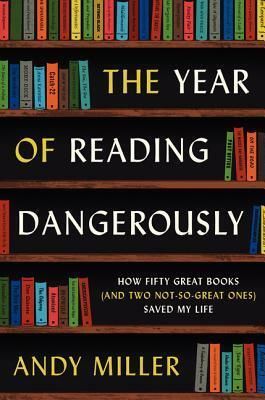 I'd love to read My Year of Reading Dangerously, but I hate spoilers ... might be a good one for the future, though. And given what you're in to right now... another book on my list (from a Book Riot podcast suggestion) is What We See When We Read by Pete Mendelsund. Hopefully I get it and if I do, I'll let you know what I think! I always have a hard time with books about books/reading. I find myself getting too opinionated about the reading habits of others -- perhaps a hazard of being a book blogger! Do you find yourself analyzing your reading (as well as the author's) when you read those books?